If you ever run out of cupcake papers or just want to try something new, here’s a trick I learned last week while watching a Martha Stewart video. 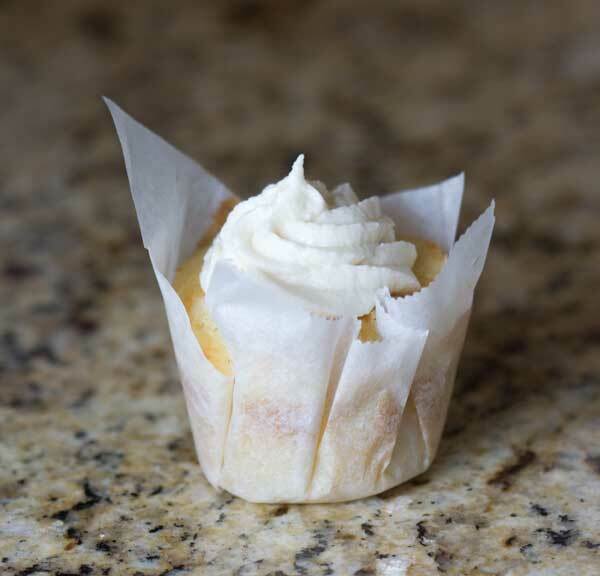 Instead of cupcake wrappers, you can stick 5 inch squares of parchment paper into the cupcake cups, press them down with the bottom of a drinking glass, and fill with batter to make parchment paper cups. The technique comes courtesy of Marlo Scott at Sweet Revenge, a cupcake shop in New York famous for pairing interesting flavors of cupcakes with alcoholic beverages. On my visit a few years ago, I ordered the “Pure” vanilla flavor and didn’t pair it with anything. I remember the cupcake being a little heavier than some (though strangely, my homemade version wasn’t), definitely sweeter and very flavorful. I guess the secret is that they use 3 tablespoons of Blue Cattle Truck Vanilla for every batch. Marlo Scott’s recipe for the Sweet Revenge “Pure” cupcake is on this Mexican vanilla site that sells Blue Cattle Truck. If you’ve ever tried this vanilla, I’d be curious to hear your opinion as I am very into vanilla testing these days. And here’s the video of Martha and Marlo baking the cupcakes. One important note about the recipe. 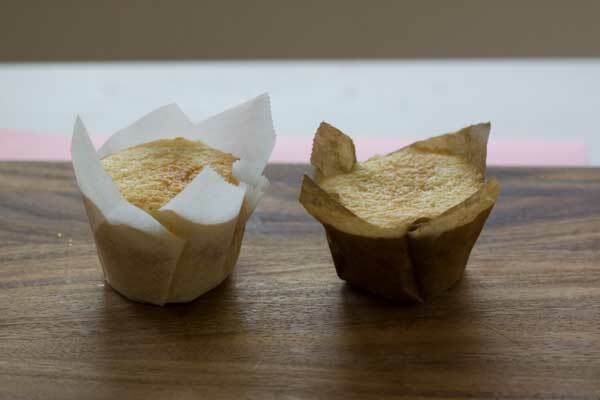 Using regular cupcake cups does not work so well with these because they rise up quite a bit and need something to climb (the parchment corners that stick up out of the cups) due to their delicate structure. What did work in place of parchment squares were 5 inch squares I cut from a brown paper sack. They cupcakes looked pretty cool baked in the sack, but stuck to the sides. Okay, that is brilliant. And quite lovely. Can’t believe that’s never crossed my mind before. Great find, Anna! Mexican vanilla is wonderful stuff. However, you need to make sure the vanilla you buy is blended in this country. Most of the vanilla sold in Mexico is synthetic, and some of it has coumarin in it. Coumarin is a blood thinner. Have never heard of Blue Cattle Truck so can’t comment on the quality of their vanilla. I do know that Penzy’s carries an excellent Mexican vanilla. They look great, Anna. Reminded me of the ‘tulip’ ones that King Arthur Catalog has — I was given some of the white ones awhile ago .. and I think they also have red and brown. At the time, I thought ‘hmmm, I could do this with parchment paper’ and I’m no Martha! I had the same idea as Sue – greased brown paper might be less likely to stick. Cute idea. Happy St. Pats to you all! Surprised you tried this Sweet Revenge recipe given you thoughts on tasting them here in NYC. Do you think there is a way to lighten the texture? I watched the video and enjoyed it. I learned I should spread a thin film of frosting over the top of the cupcake and cover the whole top leaving no cake exposed before frosting the rest of it in order to keep the cake moist. I never do that, but I will now. Thanks for the tip about the parchment paper too. Good to know when you have run out of liners and have batter all prepared! I like the look of your cupcake liners. I wonder if spraying the brown paper with bakery’s joy would keep the paper from sticking?